Accusing federal prosecutors of attempting to gain a “tactical advantage,” attorneys for a state district judge facing bribery charges filed a motion for a venue change, according to court records. 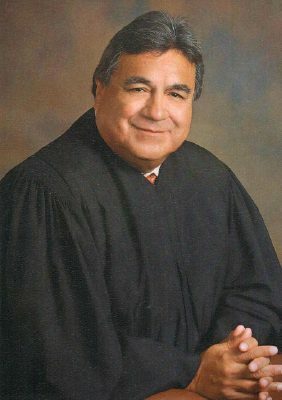 District Judge Rodolfo “Rudy” Delgado’s attorney, Adolfo “Al” Alvarez, filed the motion Wednesday seeking a venue change in federal court, requesting the case be moved from Houston to McAllen. Alvarez makes the argument for a venue change based on the criminal complaint filed against Delgado, which alleges he took bribes from attorneys in exchange for favorable judicial consideration in his courtroom — all allegedly taking place in Hidalgo County. Alvarez also requested the court set a hearing to argue the merits of the venue change motion after prosecutors made Alvarez aware of their opposition to the request, court records show. “Finally, defendant requests a hearing be held on this motion so that a record of testimony and arguments presented may be created for appellate purposes if needed,” the venue change request states. Delgado remains free on a $100,000 bond granted Monday, Feb. 5, when he stood before U.S. Magistrate J. Scott Hacker for his initial appearance on the allegations of bribery contained in a criminal complaint, which was unsealed that day. Upon his release, Delgado, who has presided over the 93rd state District Court in Hidalgo County for more than a decade, told media gathered outside the federal courthouse in McAllen that he would not return to the bench and was unsure about the status of his campaign for the 13th Court of Appeals. According to the complaint filed against Delgado, FBI agents began investigating the judge in connection with allegations of bribery in November 2016. The complaint details how they used a confidential human source to obtain information on Delgado. The source told FBI agents that the pair would set up the meeting by telephone, and that the bribe payment would take place in person — often utilizing “coded” language to communicate regarding the bribe, according to the complaint. A date for a hearing on the venue change motion was not available as of this posting.